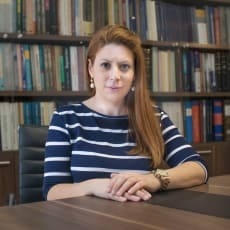 Dr Christina Ioannou is associate dean of the school of law of the University of Nicosia and associate professor of European politics and labour law. She acts as a consultant on labour and employment law issues with the law firm A & E C Emilianides, C Katsaros & Associates LLC. She holds a PhD and an MA from the University of Manchester and a BSc from the University of Warwick. She is the editor-in-chief of The Cyprus Review. She is also the coordinator of the University of Nicosia MA programme in law and politics in the European Union, and a member of the board of directors of the Centre for Scientific Dialogue and Research. Her areas of specialisation include labour law, European integration, Europeanisation and social policy. She has participated in a number of EU-funded projects, as well as a number of conferences, colloquia and discussion networks. Her latest publications include articles in international peer-reviewed journals, book chapters and the book monograph Labour Law in Cyprus, which is published as part of the International Encyclopaedia of Laws series (Kluwer Law International: Hague, 2016).